The popularity of mod monkey with the blue and yellow colour theme was an outstandingly popular party idea which has now been revitalised specifically for girls with a pink and green colour scheme. Pink mod monkey party supplies are available both online and in stores, enabling girls of all ages to enjoy the monkey with attitude. 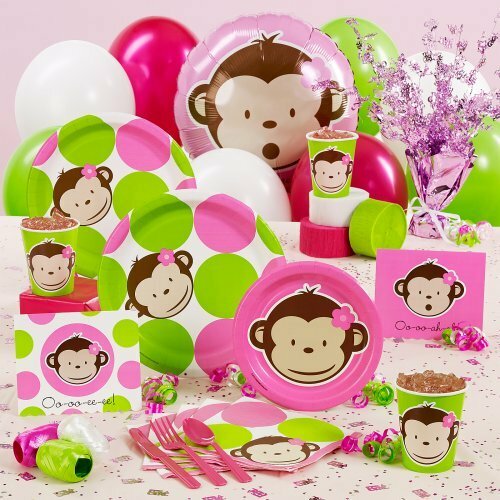 There are a huge range of materials available in pink mod monkey party supplies, ranging from invitation cards, decorations and table centre pieces to gift bags, piñatas and table supplies. Simply choose the key pieces that are needed for your party and let your imagination take it from there. Although it is possible to have a successful party using only a few set pieces of pink mod monkey supplies, an outstanding party can be had if a little imagination is added to the general scheme of things. Inviting guests to come in pink or green clothes and providing them with pink mod monkey masks upon arrival ensures that there is an instant visible cohesion. This can be developed through the use of only pink or green decorations, with a variety of palm trees (either paper or blow up types) strategically placed. Monkey games are a very good way to keep children occupied, with pin the tail on the monkey, a variety on the traditional game of pin the tail on the donkey, as well as a banana eating contest without hands etc. ensuring that the monkey theme is consistent throughout. Creative activities relating to monkeys and palm trees are a useful way to keep children occupied, as well as solving the problem of a take home gift bag at the end of the party. Activities such as sticking leaves onto a central trunk, colouring in and cutting out monkey masks etc are both ideas that appeal to a variety of age ranges. Overall, pink mod monkey party supplies are an ideal choice for females of any age. With a party in a box being easily available, all that is required for a fantastic party is a little imagination to make the pieces the best that they can be. So with most of the work already done for you, simply relax under your very own palm tree.